Podlena, M., Böhm, M., Múčka, M., and Bomba, J. (2017). "Determination of the bending moment of a dowel and tenon joint on window profile IV 92 of a wooden window," BioRes. 12(2), 4202-4213. This study deals with calculating and comparing the bending moments of two types of corner joints for commercially produced wooden sashes. The triple tenon and mortise joint was compared to a dowel joint on the sash of a window profile IV 92, made of spruce glued laminated timber. On the testing machine, the maximum force in the angular plane of a window sash under compression or tension mode was applied, and the measured values were converted to the bending moments. A significant difference between the bending moments for the mortise and tenon joint, and dowel joint were determined. The dowel joints achieved 167 Nm in a tensile test and 168 Nm in a compression test, while the mortise and tenon joint achieved 344 Nm in a tensile test and 325 Nm in a compression test. However, a significant difference was not revealed between the compression and tension tests for both types of joints. The differences for both types of joints were explained via the different sizes of the bonded surfaces, which was higher for the tested triple tenon and mortise joint by 29%. At the end of the 20th and at the beginning of the 21st centuries, thermo-technical properties of opening windowpanes were improved through the use of glued laminated timber, insulating glass, and a multipoint locking system. The size of a window profile was gradually expanded in the direction of the temperature gradient from 68 mm, through 72 mm, 78 mm, and 88 mm, to 92 mm and higher. According to the standard DIN 68 121-1 (1993), window profiles are labelled with letters “IV,” having the reference of a single window (or doors) fitted with insulating glass. An opened single tenon and mortise was used as a corner joint on the smallest profile, which was replaced by a double, then triple tenon and mortise as the profile increased. Larger profiles allowed for thermally insulating double and triple glazing to be fitted, which helped with decreasing the heat transfer coefficient by as much as 75%, compared to single glazing (Hochberg et al. 2010). 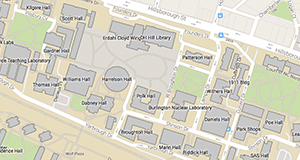 Through their glazing, windows represent a structural element that contributes to improving the energy performance of the entire building (Pantaleo et al. 2013). However, due to the weight of the insulating glass, increased demands are placed on the strength of the corner joints. Here it was necessary to achieve greater strength and stiffness of the corner joints, which increases along with the increasing bonded surface (Warmbier and Wilczyński 2000; Wilczyński and Warmbier 2003; Hajdarević and Šorn 2012). For utilizing passive solar gains, glass surfaces also have tended to be maximized in the curtain walling of buildings, thereby again increasing the load on the corner joints of window sashes. The IV 92 window profile with tenon and mortise in the corner joint is currently the most commonly used window profile. Dowel joints are the most frequent alternative to tenon and mortise (Bahlmann 2011; Hrovatin et al. 2013a; Pantaleo et al. 2013). Dowel joints provide many advantages for manufacturers. The top and bottom rails are always shorter by two widths of a bonded profile because they do not need material for the creation of joints, such as in the case for an opened tenon and mortise joint. Drilling dowels uses less energy than milling, and less waste is created. The production process is thus simplified and faster, due to the necessary profiles and holes for the dowels being formed by one machine. This increases manufacturing productivity and reduces production costs. The dowels are therefore able to compete with the tenon and mortise joint by accepting a lower strength (Efe et al. 2005; Hrovatin et al. 2013a; İmirzi et al. 2015). Despite the overall lower strength of dowel joints (Pantaleo et al. 2013), the experimental tests and modelling using the finite element method have established that dowelled window sashes with the application of structural silicon still have sufficient stiffness. Generally, the size of a bending moment and the stiffness of dowel joints can be affected by the dowel spacing, diameter, and depth of dowels (Warmbier and Wilczyński 2000). The comparison also showed that beech dowels in beech wood species have a higher strength than the oak species. Therefore, the wood species is also important. Another fastener is the Hoffmann Dovetail Key joint (Joščák and Kollár 2007), and further research was performed for the substitution of the mentioned joints with a wooden ring (Hrovatin et al. 2013b). 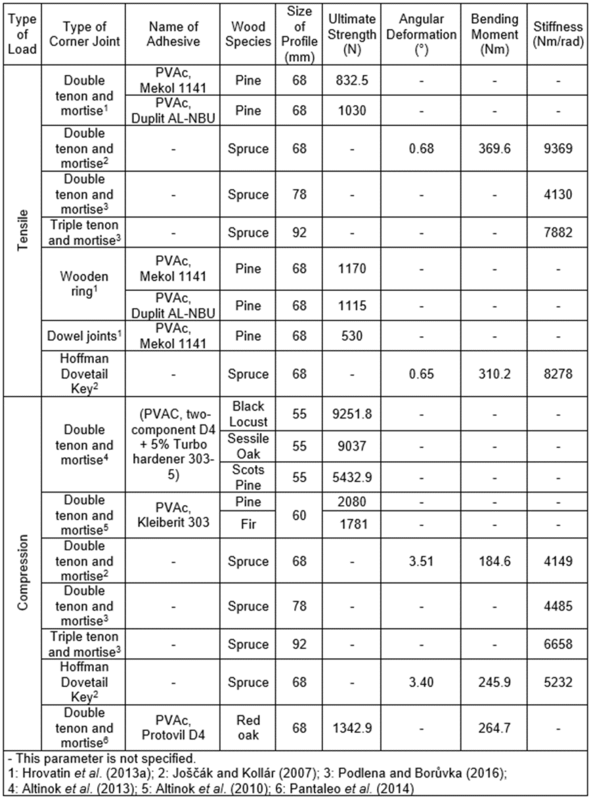 Table 1 shows that the variability of the strengths of joints is primarily affected by the type of corner joint, the type of adhesive, wood species, and the size of the profile, which, like the type of joints, relates to the size of the bonded surface. In addition, the glue line thickness (Hajdarević and Šorn 2012; Ratnasingam and Ioras 2013) and the temperature (Altinok and Kiliç 2004) also affect the strengths of the joints. The wood moisture content can have an effect with a different type of adhesive on the breaking strength too (Tankut 2007; Bomba et al. 2014). The measurement results are dependent on the methodical measurement procedure, which is not unified for testing the corner joints of wooden windows. Pantaleo et al. (2014) also mentioned that there are no specific procedures for testing rectangular corner joints. At this time only one standard for testing the corner joints of plastic windows, EN 514 (2000), has been proposed. The present research included the testing of the corner joints of window profiles in the angular plane under compression or tension under normal conditions until a load at maximum force (Fmax) was attained. However, the values of the joints can also be measured in the elastic area, such as in Podlena and Borůvka (2016), wherein it was determined, when comparing profiles IV 78 and IV 92, that the values of stiffness from the elastic area (10% and 40%) correlate (0.69 to 0.84) to the values from the maximum stiffness. During the testing of the corner joints, the progressions of forces derived from the moving crosshead of the testing machines are recorded depending on the displacement. As Table 1 shows, the force is also the most frequently monitored variable, but its value depends on the arm length. According to the size of the displacement, through the trigonometric function, the change in the inner angle is calculated for rectangular joints (Simeonova et al. 2015). The bending moment (M) is directly proportional to the size of the loading force and moment arm (l) (Eckelman 1971), and the resulting stiffness of the corner joints is calculated using the proportion of the bending moment to the change in the internal angle (c) (Erdil et al. 2005). Most researchers have only conducted tests on profiles IV 68 and smaller, which have now been replaced by bigger profiles. Measurements for this study were therefore performed on samples of window sashes with a profile IV 92 joined with a triple tenon and mortise, which was compared with a dowel joint. The bending moment calculated from the maximum load was selected as a characteristic for the strengths of the corner joints, which are comparable with the other joints. Test samples used were sash frames manufactured from spruce glued-laminated timber in accordance with the standard EN 14220 (2007) on profile IV 92 (Fig. 1a). The samples were supplied by window manufacturers conforming to their production standard. The length of each sample arm was measured as 350 mm. Batches of 51 corner joints were fitted with triple tenon and mortise (Figs. 1b and 2a), and the second series had 32 corner joints connected with five oak dowels (Figs. 1c and 2b). The dowels had dimensions of 8 mm x 50 mm with a spiral pattern on the surface. Two holes with diameters of 11 mm ± 0.5 mm were drilled through the corner joint members using a radian drilling machine (TOS Svitavy, Czech Republic) to affix the samples by pins in the test grips (Podlena et al. 2015). Tests were performed on bonded and milled corner joints whose surfaces did not have a completed surface treatment. The rabbates and grooves on the profiles differed in terms of the milling tools used by the window manufacturers. The outside rabbets of sash profiles were three-fold with grooves, which accommodate window fittings and rubber seals. The dimensions of the tested window profiles (including characteristic dimensions of corner joints) in mm are shown in Fig. 2. The corner joints were bonded using thermoplastic dispersion of polyvinyl acetate (PVAc) adhesives with D4 durability class according to the standard EN 204 (2001). The series of samples with triple tenon and mortise were bonded using the adhesive D4 Leim 1K (GreenteQ, Gillingham, United Kingdom). The 1K Holzkaltleim D4 1K adhesive (Würth, Künzelsau, Germany) was used for the second series of joints. The selected characteristic properties specified in the technical sheets of the aforementioned adhesives are summarized in Table 2. The specified pH values of the adhesives were determined at a temperature of 20 °C according to ISO standard 976 (2013) and the viscosity of adhesives according to ISO 2555 (2015). To eliminate moisture content’s effect on the strength of the joints, the equilibrium moisture content of all samples was stabilized in a climate chamber (Memmert GmbH + Co. KG, Schwabach, Germany) with a temperature of 20 °C ± 2 °C and a relative humidity of 65% ± 5%. The corner joints samples were then taken for mechanical tests in an angular plane of compression (Fig 3a), or tension (Fig 3b). Perfect rigid members were expected during the calculations. The moment arm (l) is the perpendicular distance from the line action of the force to the axis of the rotation. The centre of moments is located at the intersection of the lines that are parallel with the edges of the members and pass through the centre of the pins in the fixing component. An analysis of variance (single-factor ANOVA) and a multiple comparison test (post-hoc Tukey) were performed for a statistical assessment of the calculated results by software Statistica (StatSoft, Version 12. 0, Tulsa, Oklahoma, USA). When comparing the triple tenon and mortise to the dowels, the impact of the size of the bonded surface, which was measured based on the given dimensions of the joints, was also taken into consideration. The bonded surfaces were added at the point of the members contact, regardless of the fibre orientation. Because the dowels are a type of fastener that penetrates into both members symmetrically, the total surface area of the dowels was calculated by adding up half of the surface of all five dowels with the contact surface of both members. The results of the calculated bending moments for the corner joints of the window sashes on profile IV 92 are specified in Table 3. The data was divided according to the type of corner joints and load method used. The triple tenon and mortise tensile (344 Nm) achieved the highest bending moments, and it was followed by the values from the compression test (325 Nm). The size of the bending moment of the tensile tests was therefore 5% greater than that in the compression. The dowel joints were found to have approximately one-half of the tensile (167 Nm) and compression (168 Nm) test values compared to the triple tenon and mortise. Therefore, the result of the tensile test for the tenon and mortise achieved a 49% higher value when compared to the tensile test for the dowel joints. In terms of the compression test, the difference in the values was greater than 52%. In terms of the tensile and compression test values for dowel joints, the difference was less than 1%. A significant difference (P = 0.000147) was demonstrated at 95% confidence between the bending moments for the triple tenon and mortise and for the dowel joints. 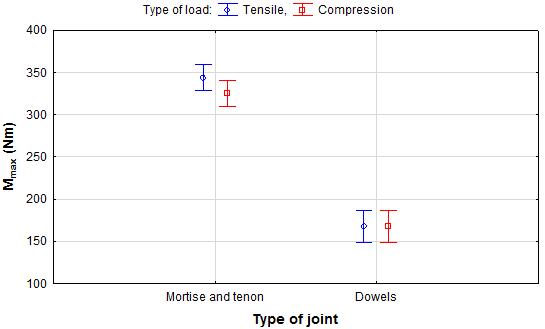 In contrast, significant difference between type of loading (compressions and tension) for the triple tenon and mortise (P = 0.3109) or dowel joints (P = 0.999985) was not demonstrated. Furthermore, significant difference was not also proven between the average values of the maximum load on an angular plane of a window sash in compression or tensile tests for the tested triple tenon and mortise or dowels (Fig. 4). The failure modes examples are presented in Fig. 5. Failure modes occurred in the wood and joint in both cases, so that used adhesives provided sufficient strength. Samples of triple tenon and mortise joint were damaged in the tests as a result of the joint rotation according to the type of load. The triple tenon and mortise is an open type of joint whose bonded surfaces adhered with the side surfaces several times. Through the multiplicity of the tenon, the bonded surface was thus increased, and so was the strength of the joint. Dowel joints were pulled out of the wood on the inner side during tensile test, or on the outer side during compression test. This behaviour explains the different failure mode of the dowels in the Fig 5b. For the expression of the stress distribution in the wooden window frame connected with dowels, Pantaleo et al. (2013) previously used finite element modelling. The fact that strength of the corner joint increases with increasing bonding surface was discussed in the Introduction, and such a dependency already has been established by many authors such as Warmbier and Wilczyński (2000), Wilczyński and Warmbier (2003), and Hajdarević and Šorn (2012). Accordingly, higher bending moment values of the triple tenon and mortise could be partially explained through the size of bonded surfaces. The sum of the bonded surfaces achieved 10260 mm2 for the tested triple tenon, but for the dowel joint the surface contact only achieved 7298 mm2. Thus, a lower bending moment of dowel joint was expected. The overall bonded area of the dowel joint was given by the sum of the sizes of the contact surfaces of both members (3905 mm2) and half of the total surface area of five dowels with dimensions of 8 mm x 50 mm (3393 mm2). Therefore, only the surface of the dowels that penetrated the member of the second arm was taken into consideration. The 49% difference in bending moments in the tensile and 52% in the compression strengths between both joints could be partially explained by the smaller size of the bonded surfaces, wherein the bonded surface for the dowel joints was 29% smaller. The results of the bending moments were partially comparable to the values specified in Table 1, as its size depended on the arm length. Joščák and Kollár (2007) tested a smaller 68 mm profile produced from a bonded spruce glued laminated timber with double tenon and mortise, which was compared to the Hoffmann Dovetail Key. The tenon and mortise in tensile mode showed 369.6 Nm in tension and 184.6 Nm in compression mode, whereas on the same profile the Hoffmann Dovetail Key only achieved 310.2 Nm in tension, but 245.9 Nm in compression. The large difference in compression or tension mode that these researchers achieved was interesting. A different double tenon and mortise, which was made from red oak, achieved average values of 264.7 Nm in compression with another 68 mm profile (Pantaleo et al. 2014). Based on the results of the bending moments of this research, the authors confirmed that the tenon and mortise joints had the highest strength of all of the researched types of joints. However, the diversity of the samples and methodological procedures did not allow for a comparison of the findings of all the other studies with sufficient precision. When comparing dowel joints, it is important to emphasize that the window manufacturer used uncommon oak dowels on the test samples of this research. The findings from other studies show that the strength of the tested dowel joint can be optimized using beech dowels, or by increasing the number of dowels in the corner joint, which increases the bonded surface of the joint. The question remains to what extent these changes would weaken the cross-section of the members. In the IV 92 window profile, the triple tenon and mortise joint achieved a bending moment value of 344 Nm at a load in an angular plane for tension, and 325 Nm for compression. A statistically significant difference (P = 0.3109) at a confidence level of 95% was not demonstrated among the results of the tensile and compression values for tenon and mortise. 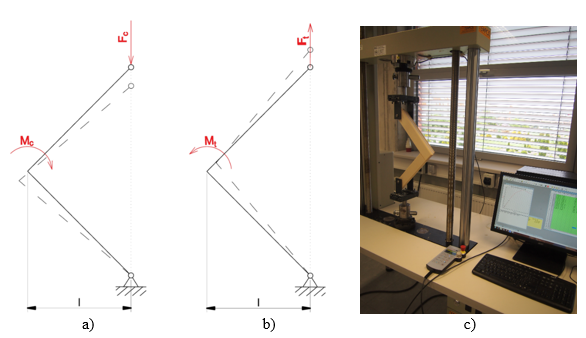 In the IV 92 window profile, the dowel joints demonstrated significantly lower values of bending moments in the tensile test at 167 Nm, and 168 Nm in the compression test. A statistically significant difference (P = 0.999985) at a confidence level of 95% was also not demonstrated among the results of dowel joint tensile and compression tests. Via a single-factor analysis of variance test, a statistically significant difference (P = 0.000147) at a confidence level of 95% was demonstrated for the bending moments for triple tenon and mortise and for dowel joints. Specifically, this was a 49% difference in the tensile test and 52% in compression between both joints. The bonded surface of the tested triple tenon and mortise (10261 mm2) had a 29% greater bonded surface size compared to the dowel joints (7298 mm2) that were commercially made, which significantly affected the rigidity of the corner joints, and the size of the bending moment. Given the measured results and the increasing demands and requirements for load bearing of fillings of a frame structure, it was better to particularly prioritize tenon and mortise as a type of corner joint for large windows. Adversely, dowel joints could be used successfully for smaller windows. This research was conducted with the financial support from the Internal Grant Agency of the Faculty of Forestry and Wood Sciences at the Czech University of Life Sciences Prague, Project No. B01/16. Altinok, M., Döngel, N., Söğütlü, C., and Doruk, Ş. (2010). “Determination of diagonal compression performance of the wooden joinery corner joints with mortise and tenon,” Journal of Forestry Faculty 10(2), 96-101. Altinok, M., Doruk, Ş., Arslan, A. R., and Gürleyen, L. (2013). “Determination of the effects of wood types and impregnation process in performance of the window frames corner joints,” Wood Research 58(2), 275-284. Altinok, M., and Kiliç, A. (2004). “Determination of bonding performances of modified polyvinylacetate (PVAC) and Klebit 303 (K.303) adhesives in different hot-surroundings,” Journal of Engineering Sciences 10(1), 73-80. Bahlmann, H. (2011). “Fensterelement,” in German, (https://www.google.com/patents/DE102011103196B4?cl=de), 26 November 2016. Bomba, J., Šedivka, P., Böhm, M., and Devera, M. (2014). “Influence of moisture content on the bond strength and water resistance of bonded wood joints,” BioResources 9(3), 5208-5218. DOI: 10.15376/biores.9.3.5208-5218. DIN 68 121-1 (1993). “Timber profiles for windows and window doors; dimensions, quality requirements,” German Institution for Standardization, Berlin, Germany. EN 14220 (2007). “Timber and wood-based materials in external windows, external door leaves and external doorframes -Requirements and specifications,” European Committee for Standardization, Brussels, Belgium. EN 204 (2001). “Classification of thermoplastic wood adhesives for-non-structural applications,” European Committee for Standardization, Brussels, Belgium. EN 514 (2000). “Unplasticized polyvinylchloride (PVC-U) profiles for the fabrication of windows and doors. Determination of the strength of welded corners and T-joints,” European Committee for Standardization, Brussels, Belgium. Hajdarević, S., and Šorn, Š. (2012). “Effect of the spread adhesive thickness and surface on strength and stiffness of joint,” in: Trends in the Development of Machinery and Associated Technology, UAE, Dubai, pp. 571-574. Hochberg, A., Hafke, J. -H., and Raab, J. (2010). Open/Close: Windows, Doors, Gates, Loggias, Filters, Birkhäuser, Basel, Switzerland. ISO 2555 (2015). “Plastics – Resins in the liquid state or as emulsions or dispersions – Determination of apparent viscosity by the Brookfield Test method,” International Organization for Standardization, Geneva, Switzerland. ISO 976 (2013). “Rubber and plastics – Polymer dispersions and rubber latices – Determination of pH,” International Organization for Standardization, Geneva, Switzerland. İmirzi, H. Ö., Smardzewski, J., and Döngel, N. (2015). “Method for substitute modulus determination of furniture frame construction joints,” Turkish Journal of Agriculture and Forestry 39, 775-785. DOI: 10.3906/tar-1406-92. Jivkov, V., Marinova, A., and Johannes, A. (2008). 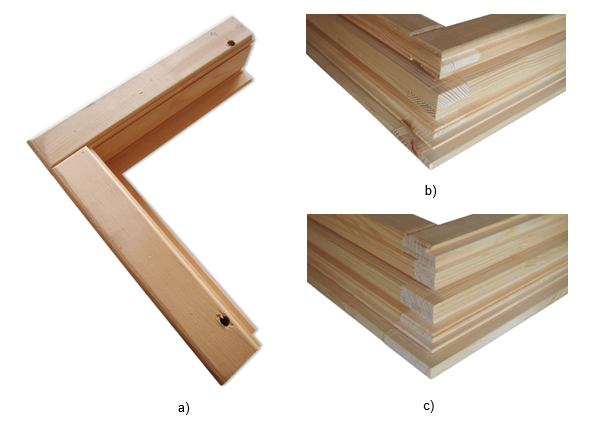 “Influence of the temperature on the bending strength and stiffness characteristics of glued corner joints of frame structural elements made from solid beech wood,” in: NABYTOK, Technická univerzita, Zvolen, (pp. 1-10). Joščák, P., and Kollár, P. (2007). “Strength characteristics of Hoffmann-Schwalbe corner joints of window sash,” in: Annals of Warsaw University of Life Sciences, Warsaw University of Life Sciences, Warsaw, pp. 291-295. Pantaleo, A., Ferri, D., and Pellerano, A. (2013). “Wooden window frames with structural sealants: Manufacturing improvements and experimental validation of a finite element model,” Journal of Adhesion Science and Technology 28(2), 115-135. DOI: 10.1080/01694243.2013.827093. Podlena, M., and Borůvka, V. (2016). “Stiffness coefficients of mortise and tenon joints used on wooden window profiles,” BioResources 11(2), 4677-4687. DOI: 10.15376/biores.11.2.4677-4687. Podlena, M., Borůvka, V., and Bomba, J. (2015). “The strength determination of corner joints used for wooden windows,” in: Annals of Warsaw University of Life Sciences, Warsaw University of Life Sciences, Warsaw, pp. 149-153. Ratnasingam, J., and Ioras, F. (2013). “Effect of adhesive type and glue-line thickness on th fatigue strength of mortise and tenon furniture joints,” European Journal of Wood and Wood Products 71, 819-821. DOI: 10.1007/s00107-013-0724-1. Simeonova, R., Marinova, A., and Jivkov, V. (2015). “Study on stiffness coefficients under bending test of end corner detachable joints of structural elements made of plywood,” Innovation in Woodworking Industry and Engineering Design 1(7), 59-66. Tankut, N. (2007). “The effect of glue and glueline thickness on the strength of mortise and tenon joints,” Wood Research 52(4), 69-78. Warmbier, K., and Wilczyński, A. (2000). “Strength and stiffness of dowel corner joints: Effect of joints dimensions,” Folia Forestalia Polonica 31(seria B), 29-41. Wilczyński, A., and Warmbier, K. (2003). “Effect of joint dimensions on strength and stiffness of tenon joints,” Folia Forestalia Polonica 34(seria B), 53-66. Article submitted: December 26, 2016; Peer review completed: March 30, 2017; Revised version received and accepted: April 13, 2017; Published: April 25, 2017.